Whether it is improper storage of paint waste or the improper and unlawful disposal of paint waste this can cost your shop thousands of dollars in fines however it could cost you your business. In March of this year an auto body refinisher in Pennsylvania exploded into flames taking firefighters over 4 hours to get the fire under control. 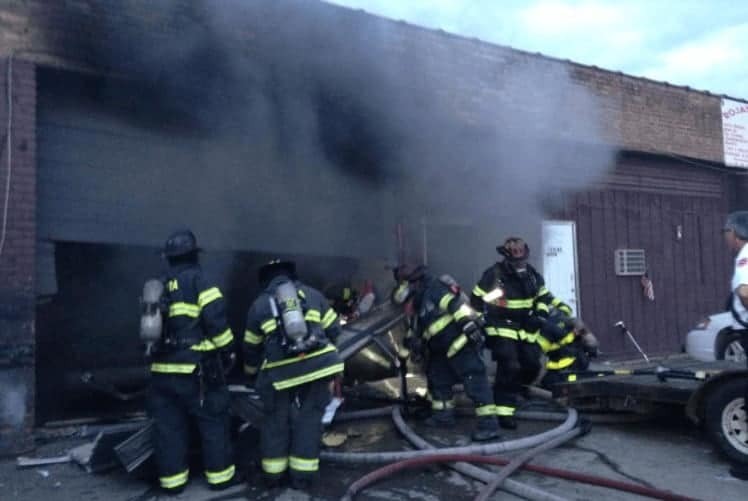 Flames were not the only danger to the firefighters, the surrounding area experienced toxic and dangerous fumes as a result of improperly stored chemicals within the shop. When it was all said and done this shop was facing not only a burned up shop but over 14 fire and permit violations ranging from improper storage of hazardous material and the improper disposal of paint and body shop waste. Fines such as these can cost a shop tens of thousands of dollars. Government records show that a number of Philadelphia auto refinish shops operate without the proper licenses or permits. Some operate illegally within residential areas, creating problems for neighboring property owners. In these areas, people tend to complain because the shops dump oil and solvents in the streets. As well paint spraying in the open air and occupying sidewalks with cars and junked auto parts. Recycling paint waste and solvents are not only the best options for our environment however it is a cost-saving allowing you to re-use your solvents, cutting expenses. At BECCA our engineers have worked to develop the very best in Solvent Saver Recycling Equipment. BECCA Solvent Saver™ Recyclers are built in the USA! Our systems reduce customer hazardous waste and solvent purchases up to 95%. The BECCA TEAM is available to help customers identify and select the best system for your application. BECCA has units sized for most applications. Whether is is a 3 & 6 gallon, 17.5 gallon, or a 55 gallon recycler. Various options are available that can maximize recycling efficiency as well as meeting the needs of most shops. We have installed our Solvent Saver Recyclers in shops, and manufacturing facilities across the USA and Canada. Resulting in saving thousands of gallons in solvent waste. Our company engineers, they will continue to drive innovation to bring the best solution for improved productivity and waste minimization. ← Are You Properly Disposing You​​r Paint Waste?